Earlier this year, I was attended Britsmum Live and met Nigel Camp thru his Hands-on Video session where he gave us tips on how to make better videos. It was a very impressive and powerful talk. He gave me encouragement and ideas on how to create better content for my videos. Comparing my older videos to the present ones, I think I have taken most of his advice on board. My latest video is no longer just the product on its own. I have come out of my shell to show the audience who is behind those big hands. Also I don’t just take the same angled shots. I’ve experimented shooting at different angles to emphasise the product. Since his session, I invested in developing my own intro (at the start of my video reviews) to tell people about my website and brand. I also have an outro to tell people my social media avenues and where to subscribe my channel. Do click here if you wish to subscribe! I believe that using video is a lot easier to show your audience your brand and product. I enjoyed vlogged and hope to improve on creating great video reviews. 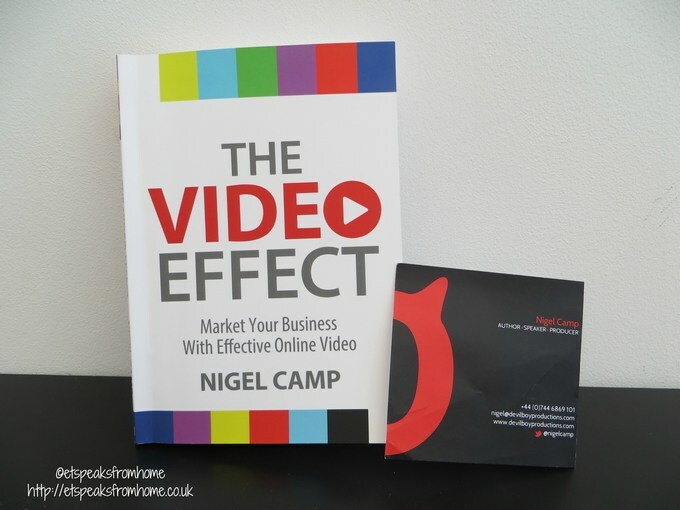 Nigel has kindly sent me his latest book – The Video Effect which is available to buy from Amazon for £10 or download it via Amazon Kindle for £4.42. This book guides you on how to effectively market your business through online videos. It’s not just for business though. I believe this book will also benefit vloggers or anyone who is keen to learn the basic tips on how to create a good video and for it to be easily searchable by others. There are nine chapters in this book: The Video Effect, Video is Social Media, Equipment for the job, Video is your Google Goldmine, Share and get it out there, Website and Videos go together, Avoid Talking to an Invisible Audience, How to deliver video with impact and Film your Way to the Top. The book explains why online video is the future media tool and covers topics from where to promote your video to free software to edit your video. It also covers how to pick the right video tools for different budgets, lighting, sound effects and many more. Tagging your video is explained too which is important to ensure that your videos can be found effectively. Beside the biggest video sharing website – YouTube, there are plenty more video sharing channels you could use to promote your video. Video Search Engine Optimisation (VSEO) is also very important to increase exposure for your video. I have made a few mistakes in the past where I wrongly tagged and labelled my product review. After editing the title and correctly tagging on YouTube, I had an unbelievable number of views on my video. From just over 100 views to now over 66k views on the Chill Factor Ice Cream Maker video with good and bad comments about it. One simple mistake like wrongly tagging will cost your business less exposure. So it is always useful to know what your keywords are. 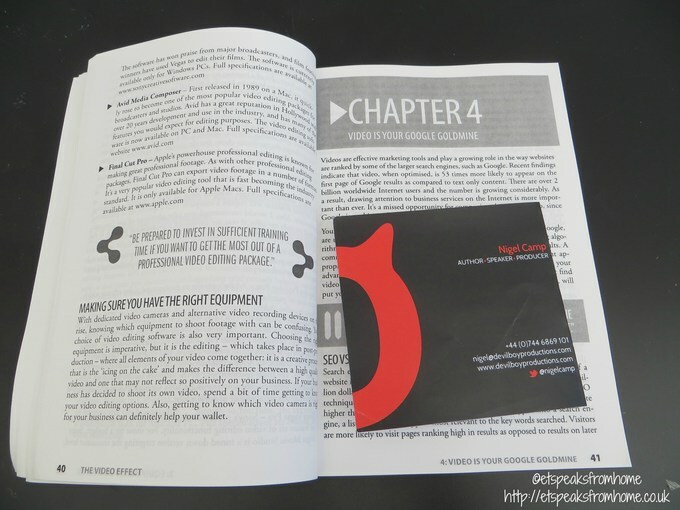 His book is definitely useful for vlog newcomers, small businesses or amateurs. This book is so easy to read (with no unnecessary jargon) and provides professional guidance. Do check out his blog The Video Effect and access a set of free products. Or if you need his professional help on creating your business video, do check out his website Devil Boy Productions. I swear he is not a devil boy, in fact, he is a very kind man! Disclosure: I have received the book to do an honest review.